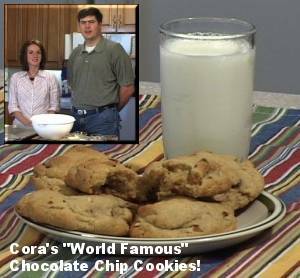 See the video of Dan and Cora making her World Famous Chocolate Chip Cookies. Click here (56k) to watch the video. If you have a high speed connection, click here (300k) to see a higher-quality video clip. Mix ingredients together in the order listed, and bake at 350 for 10 minutes. Enjoy!